First of all, it's not complete but I don't have plans for any update any time soon (or ever), so I'm releasing what I have already. This mod aims to provide a replacement for the original lower definition sprites and textures while retaining the artistic style of the original game. It can be used with Wolfenstein 3D, Spear of Destiny, both Mission Packs and a few supported mods (like the Second Encounter addon). It can also be used with any ECWolf compatible mod that doesn't change the default graphics too much. More details on the "readme" file. OBS: I forgot to include some of these in the batch so you'll have to manually edit it if you decide to download all the mods. Last edited by LkMax on Sat Dec 23, 2017 13:44, edited 2 times in total. I'll try to keep my sprite criticisms objective. Knife - Fine. 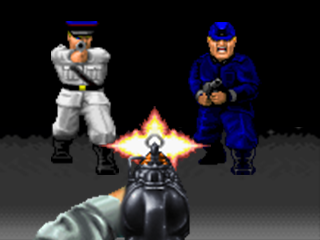 Wolfenstein's lack of blood when you hit something is somehow much more distracting with the clearer sprite, though (I realize there is nothing to do about this yet). Luger - It doesn't look much like a Luger to me. I think of a Luger as having fairly clean, slim lines, but this seems bulbous and indistinct. The perspective on the barrel doesn't quite work for me either; I keep seeing it as the player holding a black blob instead of pointing something. MP40 - Good artwork and most importantly it feels satisfying to use, but the flash could perhaps have a bit more bite to it. Chaingun - This one doesn't work for me at all. The barrel muzzles feel warped and the flash is too small and distractingly asymmetric. The enormous flash of the original made it extremely satisfying to use because it really felt like you were unloading pure power. That probably came off a bit negative but it's only because I really like the idea. Coming from Doom the absurdly low-res original sprites are distracting. Noted. No problem in giving constructive criticism, I know they're not perfect and I still plan to bring updates in the future. - Although I won't promise the chaingun muzzleflash will be as absurdely big (it's half the size of the weapon ), all weapon muzzleflashes are in the "To Do" list of changes. LkMax wrote: - Although I won't promise the chaingun muzzleflash will be as absurdely big (it's half the size of the weapon ), all weapon muzzleflashes are in the "To Do" list of changes. I see massive muzzleflash as an explicit design choice - you have to make a tradeoff between dealing a lot of damage vs obstructing your view. It's similar to how the plasma gun in Doom can very easily obscure everything. While I don't necessarily disagree with david_a00's observations, I think the new sprites are a huge improvement over the originals. Good work, LkMax. Rex Claussen wrote: While I don't necessarily disagree with david_a00's observations, I think the new sprites are a huge improvement over the originals. Good work, LkMax. I considered the view being blocked. If you compare on the screenshot you can see that despite the muzzleflash being smaller the view is blocked almost as much (only the botton is less blocked but it would make no difference at that distance). But I get it, you like big flashes for your big guns. Since Wolf has such poor weapon variation any minor flaw will get amplified by familiarity (especially the MP40 and chain gun). I expanded the Chaingun muzzleflash a little bit, replaced the pistol with a new sprite (heavly modified from the Jaguar version), added muzzle reflections on the MP40 and "hot barrel tips" on the chaingun (no changes on the knife). - New (optional) sound effects on a separated SFX file for all weapons. I don't consider these truly "faithful". To me, "Faithful", means going and actually editing the original sprites and making them less pixelated than vanilla, not replacing them with completely new sprites. And before you say it, I don't make sprites, I can give criticism on them though. These look good tbh. Nice work! RetroWolf92 wrote: I don't consider these truly "faithful". To me, "Faithful", means going and actually editing the original sprites and making them less pixelated than vanilla, not replacing them with completely new sprites. There's not much you can do with, I don't know, 16x16 pixels? (the original sprites) So some liberties have to be made. It's "faithful" in the sense that I maintained approximately the same proportions, color scheme and ideas of the original sprites (the pistol is supposed to look like a luger, the machinegun a MP40 and the chaingun a portable chaingun). What exactly you expected me to do, just double the size of the original sprites? That's what algorithms like HQ4x are made for but they don't look nearly as good, specially for such small sprites like in the vanilla game. Nokiaman wrote: These look good tbh. Nice work! Oh, I didn't notice the little subforum almost hidden up there. If a moderator wish he may change it. PS: I posted on the subforum before because I found a thread through google, I didn't pay attention to it until much later. While I concede your definition of "faithful" is accurate, I must say that what LkMax has done stays true to the spirit of Wolfenstein, while updating the graphics significantly. As such, it seems pointless to quibble over semantics.